SILICON SLOPES, Utah —September 15, 2016— Today, Domo announced that it has been recognized in Fast Company’s 2016 Innovation by Design Awards, receiving an honorable mention for its cloud-based business optimization platform in the Websites and Platforms category. This is the third Fast Company recognition Domo has received in two years. 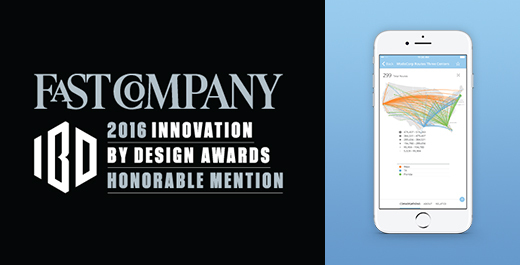 In 2016, Fast Company named Domo to its most Innovative Enterprise Software list, and in 2015, it recognized Domo as an Innovation by Design Awards finalist in the Data Viz category. The Innovation by Design Awards program, now in its fifth year, honors the most innovative and disruptive design solutions to today’s business problems. This year’s judging panel, which was comprised of the world’s best design minds, selected the finalists from more than 1,700 international submissions across 11 categories. Entries were judged on their functionality, originality, beauty, sustainability, depth of user insight, cultural impact, and business impact—the key ingredients for any innovation. In highlighting Domo this year, Fast Company highlighted Domo’s ability to bring social collaboration and relevant data to decision making through Domo’s cloud-based platform. A full list of all the Innovation By Design winners can be found here on the Fast Company website.